Legendary manga artist Naoki Urasawa (Master Keaton, Monster) will be in London on Wednesday 5th June for a special talk and live drawing demonstration in an event hosted by writer Matt Kamen and WIRED magazine. 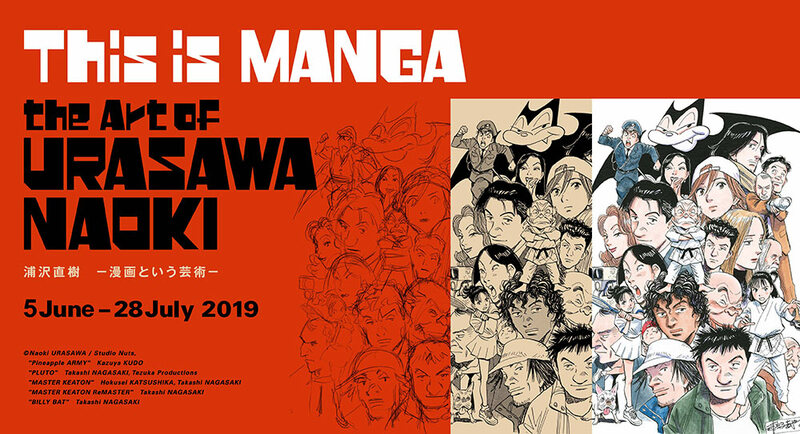 The event is connected to an exhibition dedicated to Urasawa called “This is Manga: the Art of Urasawa Naoki” which is also running at Japan House, London from June 05th to July 28th. Japan House is collaborating with WIRED for a special event with internationally acclaimed manga artist URASAWA Naoki on Wednesday 5 June 2019 from 6:30pm-9:30px at Japan House London. The exclusive one-nighter will offer audiences a rare chance to see Urasawa bring his art to life in a live drawing demonstration, and engage in discussion on his career to date in an intimate setting. Expect to have your expectations of what manga is, and who it is for, shattered by one of the industry’s greatest living artistic talents. This summer Japan House London presents an exhibition on the popular form of Japanese illustrated literature – manga – through the work of manga artist, URASAWA Naoki. Running from 5 June until 28 July 2019, the ‘This is Manga – the Art of Urasawa Naoki’ exhibition immerses visitors in the iconic Japanese art form and highlights the breadth of Urasawa’s narrative styles with a display of selected stories from some of his major works, including ‘YAWARA!’, ‘MONSTER’ and ‘20th Century Boys’. Spaces are limited so early booking is recommended. Master Keaton Manga Gets Sequel!